My husband attended the Google I/O conference in San Francisco last month and I tagged along for a mini vacation. 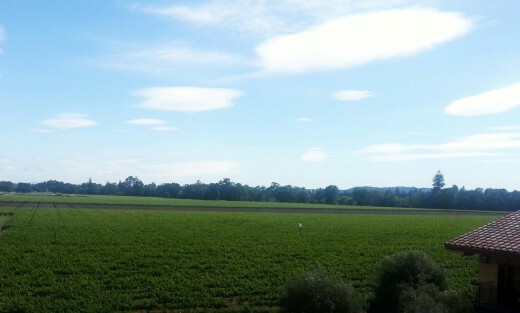 My sister came with us, so while my husband was in workshops all day, she and I went to the spa and spent a day in Napa. 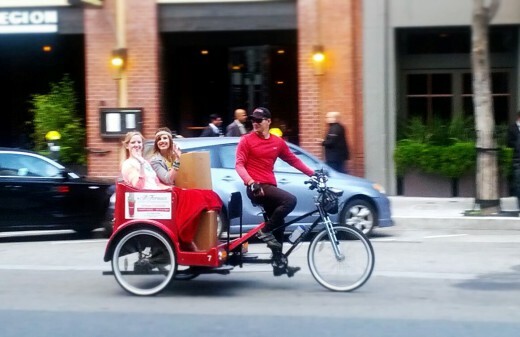 I’ve been to the Napa and Sonoma region twice, but this was my first time going while staying in San Francisco. My husband and I booked wine tours both times we went before and had a great experience, so I decided to book one again for this trip. The perks of booking a tour are you have a driver for the day and you get to stop at wineries that you probably wouldn’t know about and visit on your own (mainly because they produce smaller amounts of wine and therefore don’t reach our local wine shops). 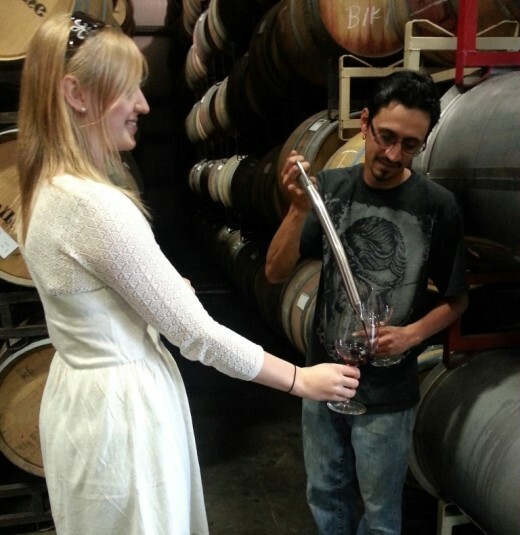 Since these wineries are less commercialized, you often receive a more private tasting experience, sometimes even led by the owner! I booked our wine tour with Platypus Tours. 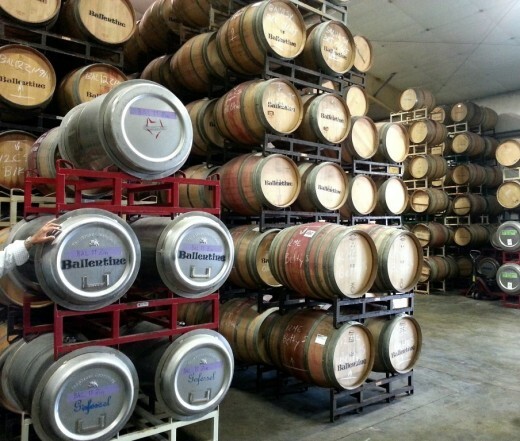 I really enjoy using this company because they focus on taking you to these hidden gem wineries. 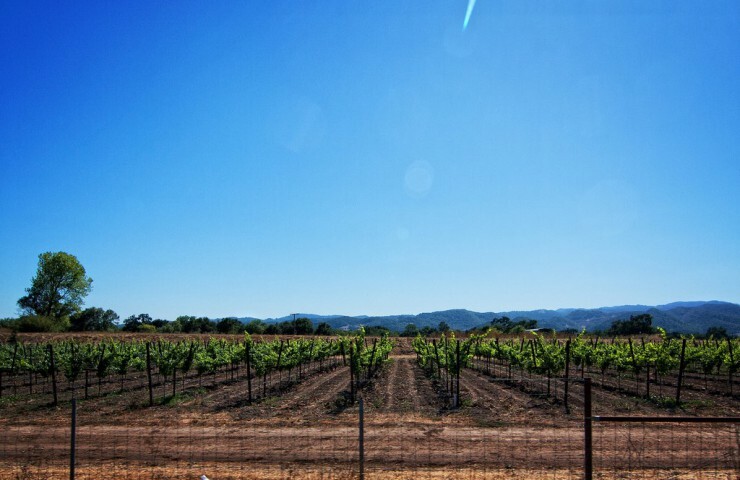 You typically visit 4 to 5 wineries during the day, with a picnic lunch at one of them. Platypus will travel around the Napa region to pick up guests for the day, but since my sister and I were coming from San Francisco, we took the San Francisco Bay Ferry to the Vallejo Ferry Terminal and got picked up there. It was about a 45 minute ferry ride and was really fun to see San Francisco from the ocean. Our tour bus picked us up promptly at the Ferry Terminal and after a few quick stops to pick up the rest of the tour group, we were on our way to the first winery of the day. 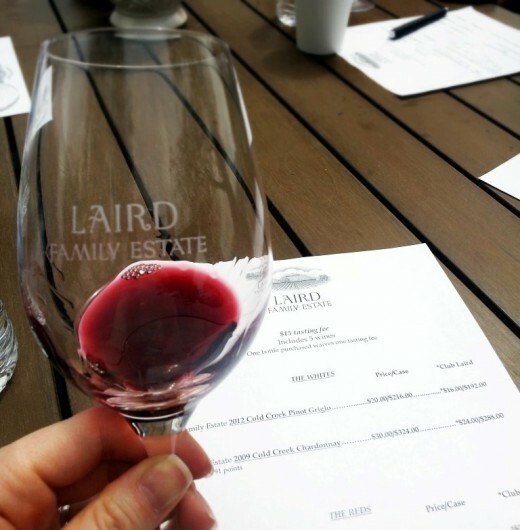 The first winery we went to was Laird Family Estate, located right in Napa. We sat outside for the tasting and enjoyed several different wines. 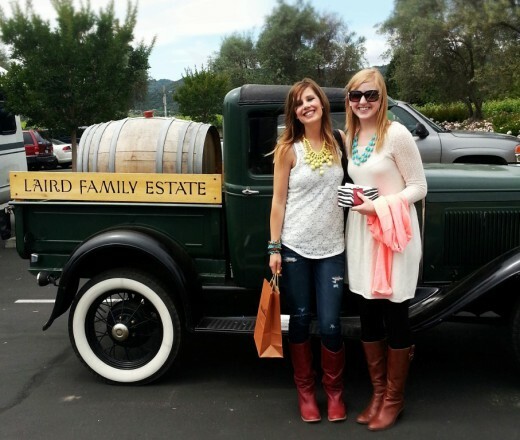 We tasted their Pinot Grigio, Chardonnay, Syrah, Jillian’s Blend, and Cabernet Sauvignon. My favorite was the Pinot Grigio, yet the Jillian’s Blend was also very enjoyable. The Pinot Grigio was fruit forward and light, yet crisp and refreshing. I bought a bottle and look forward to drinking it on our patio on a warm summer evening. Jillian’s Blend is comprised of Cabernet (from three different vineyards), Merlot, and Syrah. The flavor was incredible; it possessed all the characteristics of a robust Napa Cabernet and offered hints of berries and chocolate. We were just about to get on the bus and head to our second winery, but couldn’t pass up an opportunity for a picture. We then drove up Highway 29 to St. Helena, which is further North than Napa, and stopped at Ballentine Vineyards. We were greeted by our tour guide and a chilled glass of Chenin Blanc. We walked around the property and learned about their winemaking process. We also got to sample some red wine right from the barrel. 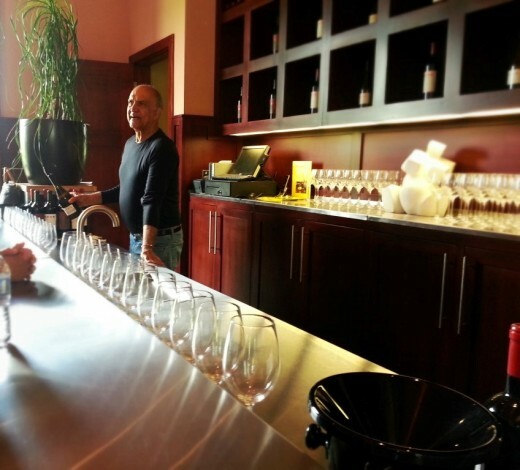 Following the property tour, we gathered in the tasting room to finish our tasting. I tried Cabernet Franc for the first time and it was my favorite wine here. Their 2008 Cabernet Franc was full bodied and smooth, and also produced from a single vineyard. I’d highly recommend checking it out. 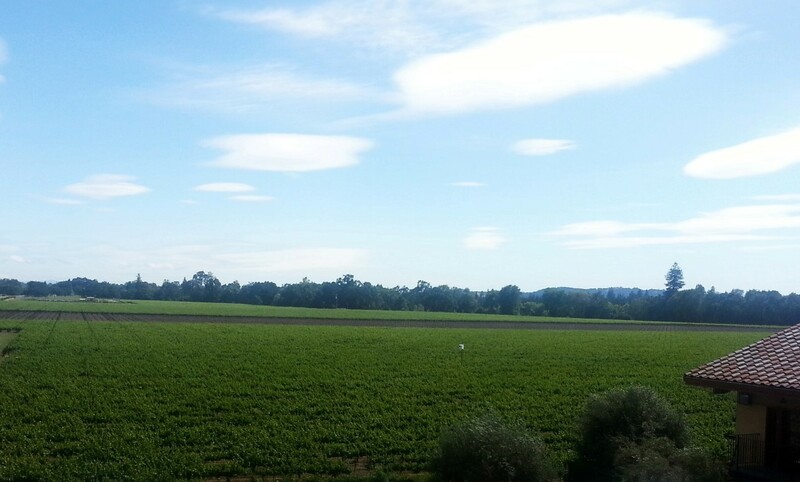 We had a nice picnic lunch outside and were able to enjoy the beautiful views of the vineyard before venturing to our third winery. 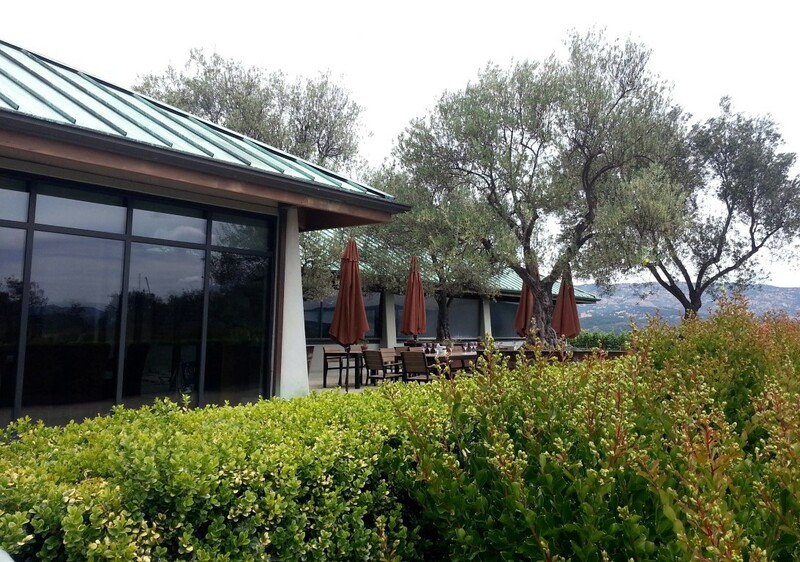 Razi Winery is located between Napa and Yountville, so we took Silverado Trail back down from St. Helena. I had never heard of Razi before, but I’m so glad we stopped there. 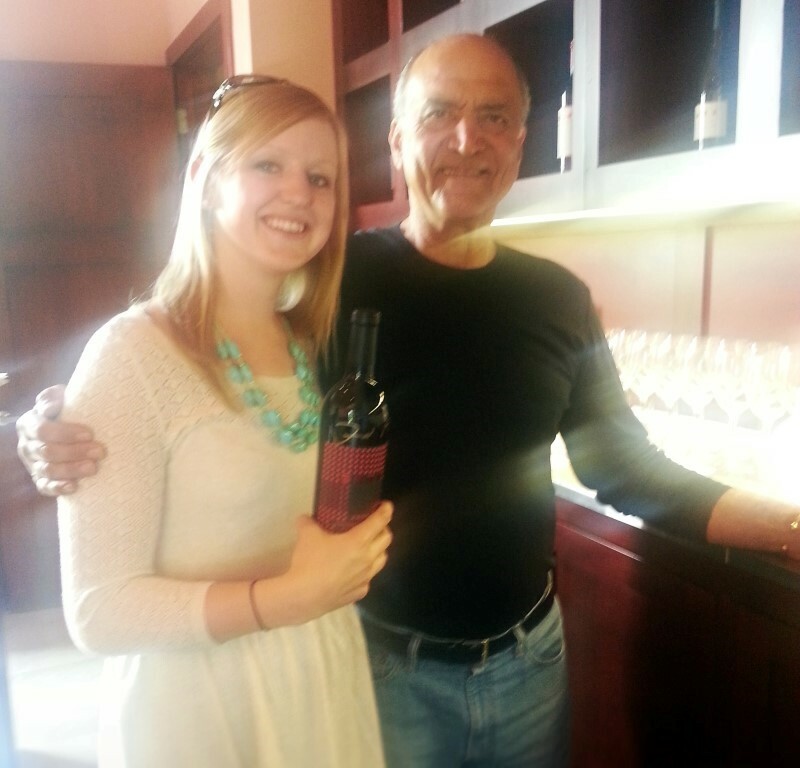 Not only was the place beautiful, we met the owner, Fred Razi, and he poured all of the wines for us. It was fun to hear his perspective on winemaking, especially because he seemed very passionate about it. We sampled the Razi Chardonnay, Shiraz, Red Blend, and Cabernet Sauvignon. My sister and I both loved the Cabernet and bought bottles to bring home with us. We even got them signed by Fred Razi and snapped a picture with him. He reminded me of my Grandpa Larry, which could be why I enjoyed this place so much. Regardless, Razi was by far my favorite winery of the trip. We finished the day at Luna Vineyards, which was located very close to Razi. We sat outside outside on the patio for the tasting and enjoyed several of their current releases, including their Pinot Grigio, Chardonnay, and Sangiovese. We also tried their Lunatic Red Blend, which is made up of Syrah, Sangiovese, Grenache, and Petite Sirah. I tasted a great balance of fruit and peppery spice, and found it very delicious. We walked up to the top of the tasting room and got a great view of their vast vineyards, with the mountains in the distance. 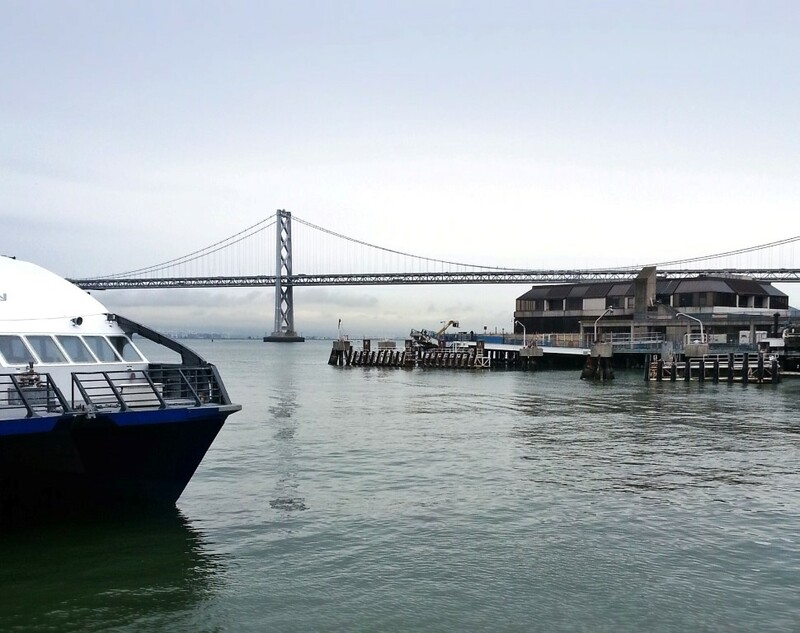 We wrapped up our tasting at Luna, got back on the bus, and headed for the Vallejo Ferry Terminal. With our boxes of wine in hand, my sister and I boarded the ferry and rode another 45 minutes back to San Francisco.